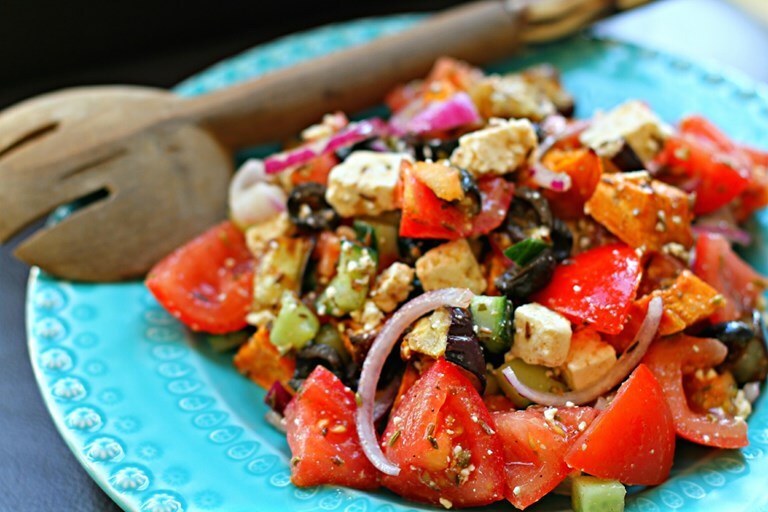 Fresh, healthy and delicious, Deena's sweet Greek salad recipe is a fantastic twist on an old classic, with the addition of sweet potato, toasted fennel seeds and cumin adding warmth and vibrancy to a traditional Greek salad recipe. My family and I all got involved in making this delicious salad, with my boy eagerly describing how the vegetables for it arrived in a massive box from a chap called Gary! He washed the glossy ripe tomatoes and after a few impatient nibbles of the cucumber, he did a good job with that too. I have to admit, my husband did a darn good job with executing much of this salad including marinating the feta in the toasted spices. It’s a rarity, so I am cherishing this memory.